It’s always startling to discover which world-changing events whirled past while we were holed-up building miniatures. The construction of our second project of 1983 coincided with the introduction of the mobile phone, the creation of the internet, and the release of the first Microsoft PC, events which went unnoticed in our studio. We did, however, watch with great anticipation the maiden flight of the Space Challenger while laying brick and beveling siding for the North Cove Kitchen. 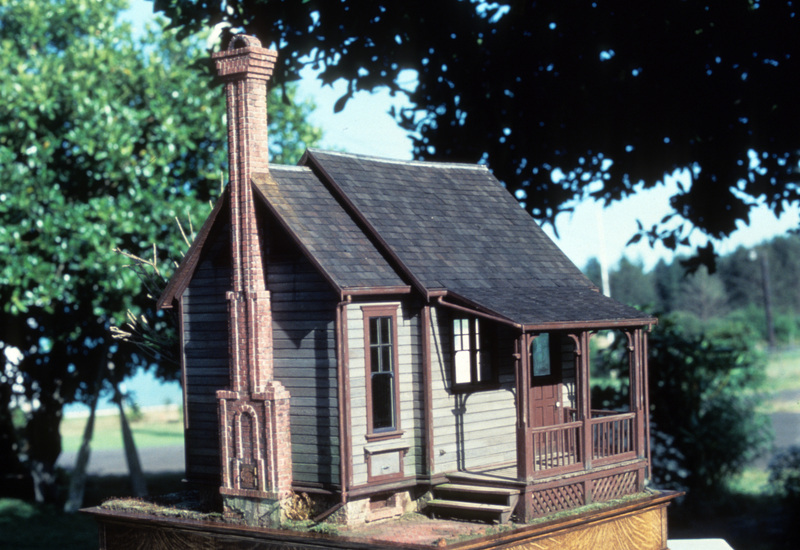 The North Cove was a single-room structure, an imagined and rather ornate outbuilding, or ell, containing only a kitchen. We took a liberal view of its era, utilizing elements of Cape Cod as well as early 1900’s beach architecture. Many of the details we chose because we felt an emotional attachment to them. Jogged by memory, circumstance, and because we had the time to focus on a single room, we played with the project without worrying much about historic accuracy. 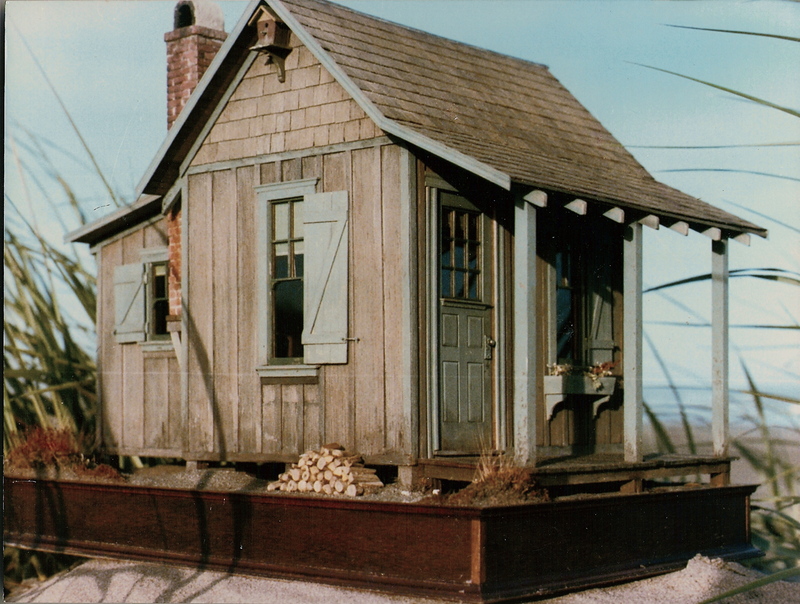 Looking back, I see that this design was the precursor to our future teaching projects–the Beach Cottage and Garden Shed. 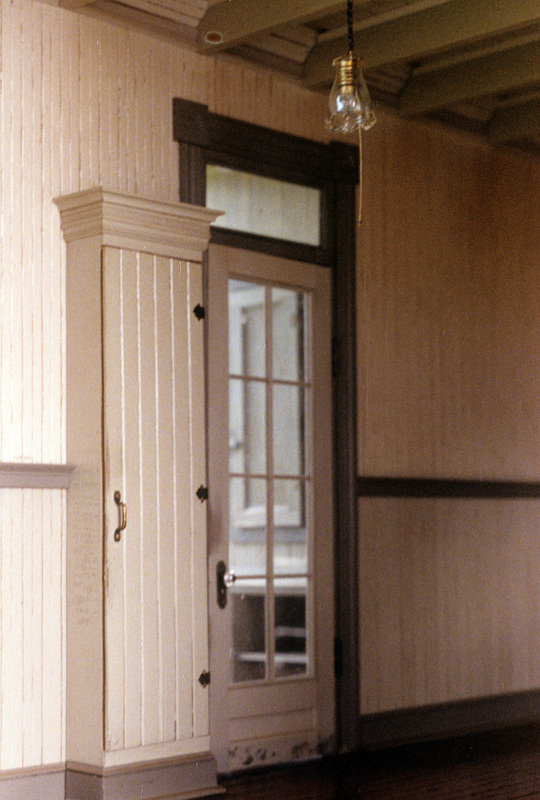 Inside, Victorian rondells embellish the door and window framing. 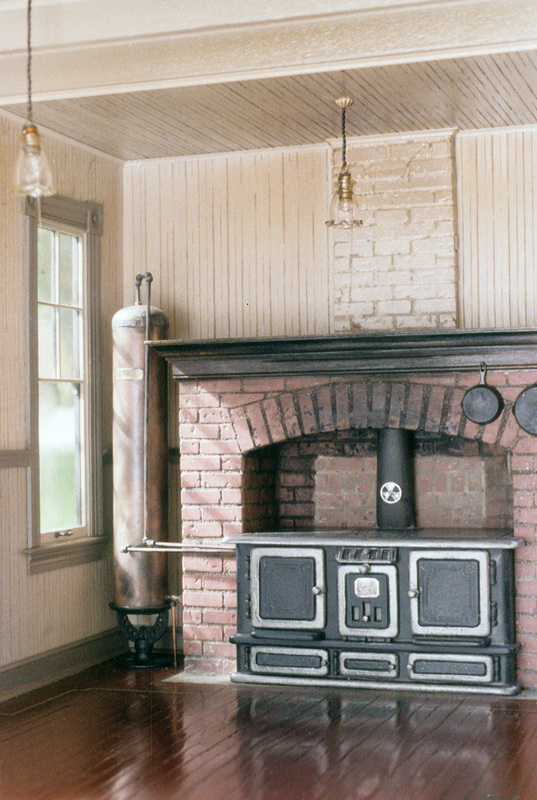 The stove, made of plywood, cardboard and miscellaneous metal findings, was built into a Colonial-inspired fireplace. Noel created an elaborate plumbing system connecting it to the copper water heater that would have supplied ample hot water for an entire house. 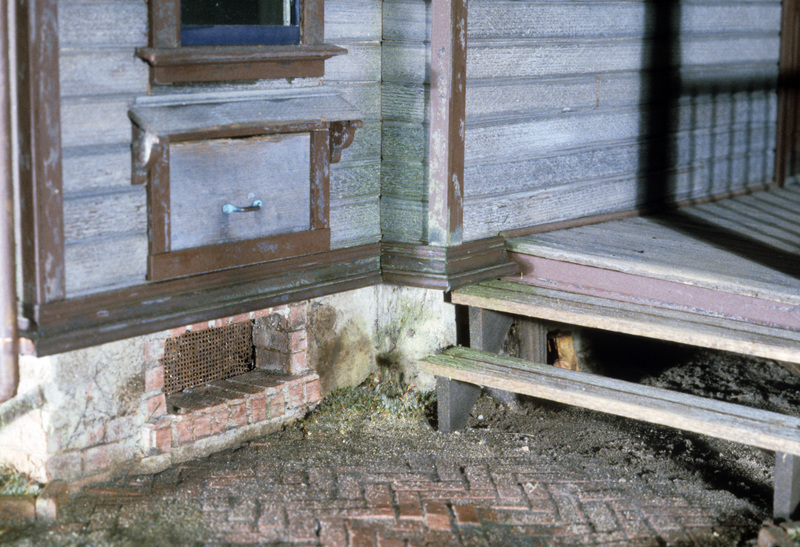 He also built in an inside-outside drawer for loading wood for the stove. 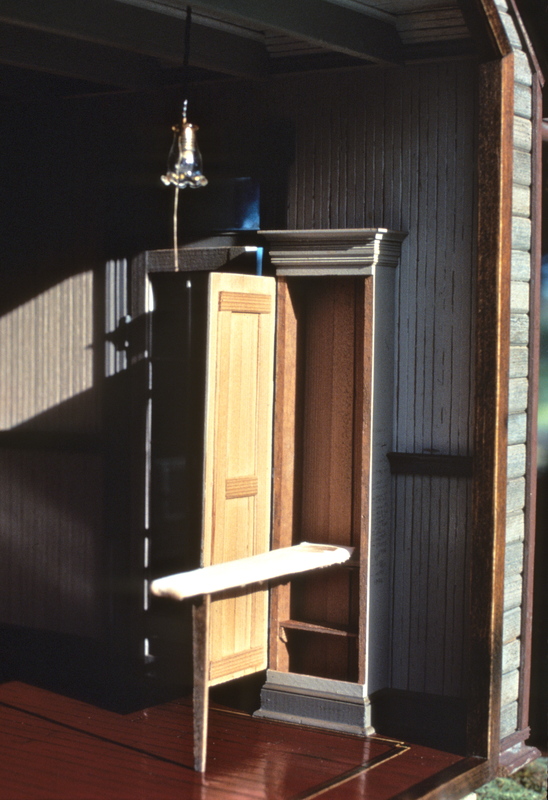 The project includes a working ironing closet, similar to one I had in an apartment during a brief stay in Georgia, a detail we also found in Washington State beach cottages. As a child I loved the smell of steam ironing, or maybe it was the residue of line-dried laundry, so we made a tiny iron with which to scorch the home-made ironing cloth on the board. The chimney is elaborate enough for a mansion—again because it was fun, and we knew how to brick. 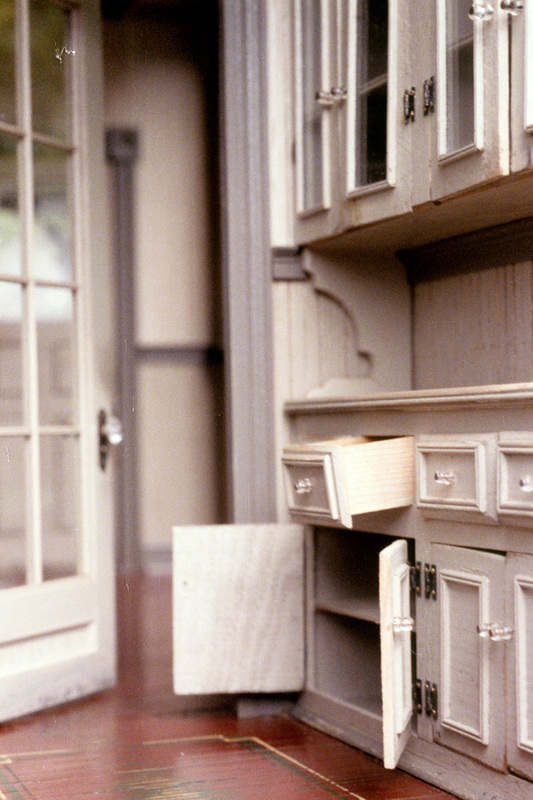 And we went a little overboard on the working cupboards and drawers in the butler’s pantry. My grandparents had a similar pantry in their 1920’s Dutch Colonial—a narrow hallway of sparkling glass, small panes, and mysterious drawers. And, in the spirit of leaving no quarter untouched, we made a crawl space above the kitchen, stringing electrical wiring around porcelain insulators (a pin and two small beads), and insulated with our miniature newspaper. 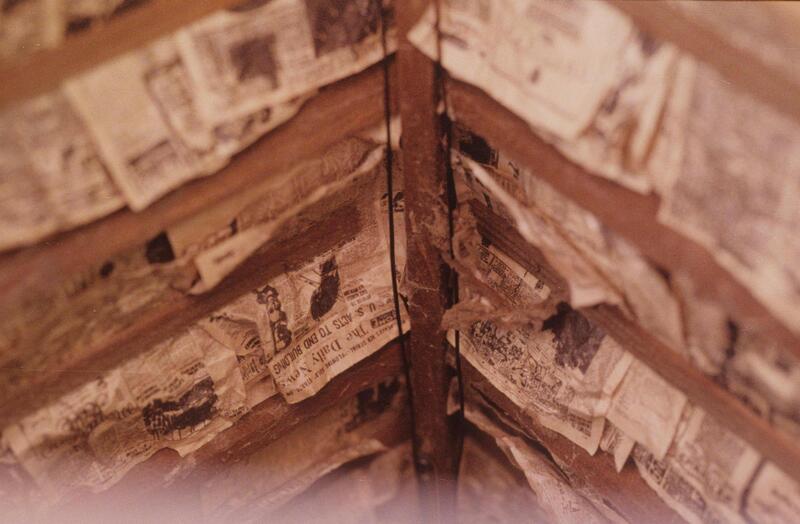 The original, full-sized newspaper was discovered by friends, lining the bottom of an old pull-out couch. Another friend, Rick, the local printer and born tinkerer, decided to see if he could recreate a readable paper in miniature on his press (even then, so old it was almost an anachronism). He could, and did, printing out 3000 sheets on cut ends of aged newsprint. 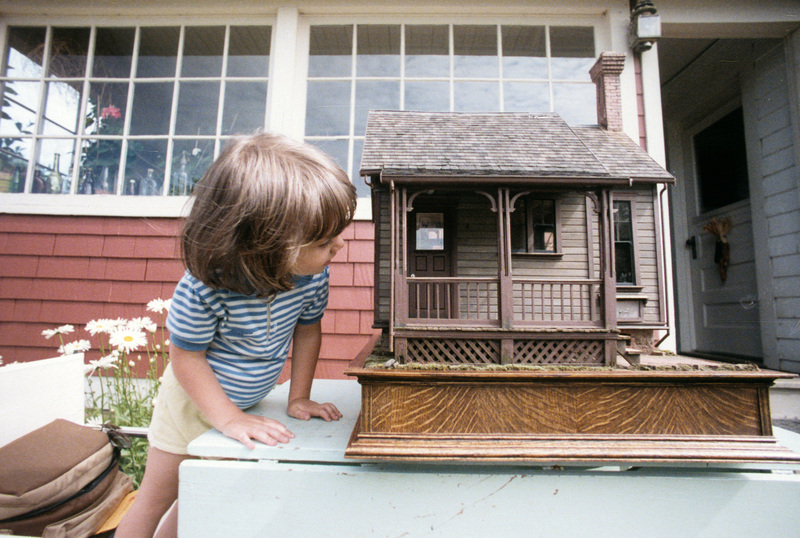 This entry was posted in Houses, Miniatures, People and tagged friends, kitchens, lifestyle, Victorian architecture. Bookmark the permalink. Oh, my goodness. Discovering you on the eve of the first storm of this winter, is like Christmas arriving before Halloween. I’m so excited! THANK YOU, thank you, for sharing your work. How nice to find this first thing in my Inbox–thank you!